Here’s the map of teams in the MLS this season. And here’s the map of teams in the NWSL this season. Twenty-four men’s teams, nine women’s teams. Why has women’s soccer been so underrepresented? Lack of funding and a small operating budget. Lack of media coverage and general exposure. The mindset that female athletes aren’t as fast, physical, athletic, etc. as men, so the game isn’t as interesting. Competition with a men’s team for media coverage and exposure. Lack of a proper venue or restrictions because of venue. Philadelphia has seen its fair share of women’s teams in various women’s soccer leagues come and go over the last 20-or-so years. The Philadelphia Charge of the Women’s United Soccer Association played from 2000 to 2003 in Villanova Stadium (they were a personal favorite in my youth soccer days). The Philadelphia Independence of Women’s Professional Soccer played from 2010 to 2012 in West Chester University’s stadium. The Philadelphia Fever of the Women’s Premier Soccer League (second tier) played in 2013 and 2016, and then played in the Women’s Arena Soccer League (opposite the men’s Arena Soccer League) in 2017. Low funding and lots of financial problems spelled the downfall of these women’s teams and leagues in our area. Now, the NWSL appears to be doing better than previous women’s soccer leagues, with attendance beginning to trend upwards and stronger ownership groups backing teams. Five of the current NWSL clubs are owned by men’s teams, Portland, Orlando, North Carolina, Utah and Houston. It’s the first time men’s teams have managed women’s teams, and it’s the key to the NWSL’s success as it enters into its seventh year. By partnering with an MLS team, NWSL teams no longer have as limited budgets, limited exposure or lack of a venue. Honestly, the NWSL expanding to Philadelphia is a bit of a long shot. 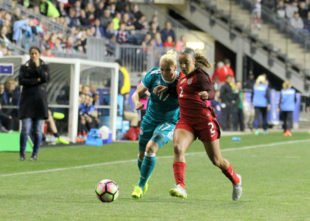 Women’s soccer in Philadelphia has been drawing in crowds since the Charge, but it’s not the city’s disinterest that prevents the NSWL’s expansion. It’s the lack of willing ownership. The obvious solution (and title of the column) is that the Union back a women’s team. Realistically, that is a long ways away, if it’s even a thought in Tim McDermott’s mind. The Union are going to spend their money on the Union first and foremost, which we can all agree needs to happen to improve the team. While the expansion of women’s soccer in America does not rest solely on the Union or even Philadelphia, the idea of an MLS-owned NWSL team is an interesting thought. 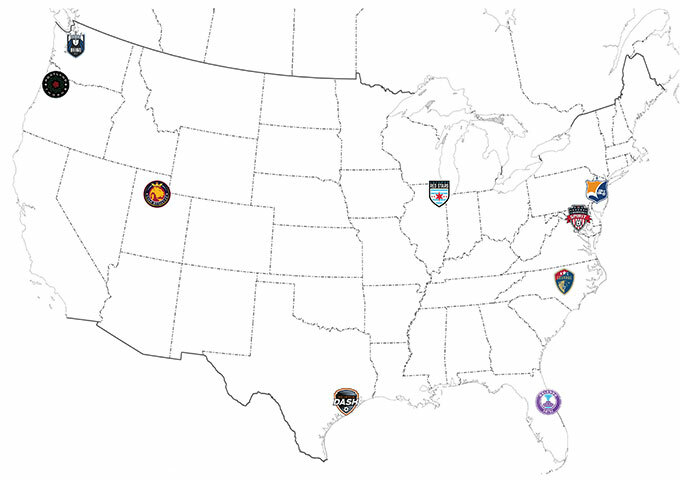 Glance back up at those two maps and you’ll see a lot of overlapping cities amongst the MLS and NWSL clubs, but you’ll also see major cities in the northeast, California and Canada devoid of any women’s professional teams, but full of men’s professional teams. Thirteen more MLS teams, including the Union that can help grow women’s soccer in America. Thanks for writing this Sara! The lack of willing ownership just seems to be such a huge hurdle for all of this. Ultimately, with the USWNT being so dominant on the international stage, the NWSL should absolutely be the league of choice the world over; that would probably include having about maybe 12-16 teams. I’d love to see an NWSL club in Philadelphia (associated with the Union or not), but it does seem like the independents really need to expand their ownership groups to make these more successful. You’re absolutely right about certain markets not having an NWSL team. The fact that California is vacant is mindblowing given the money between Galaxy and LAFC – they could probably filed a juggernaut of a women’s side. I’m pretty sure the talk with Barcelona is still in the works to operate a team in SoCal, but like everything in the NWSL, details are scarce. There needs to be a New York City-metro team or a viable Sky Blue that actually operates like a professional team instead of a U-16 travel team. Recent cries for Red Bull or City Football Group to step up hopefully are heard in the next couple years; although CFG are probably mostly focused on their own stadium situation first. Philadelphia should definitely be one of those markets, but it seems very unlikely with the shallow pockets of this current ownership group to field 3 professional teams (Union, Steel, Women’s team). The two that seem to have a lot of potential (but I haven’t heard anything) are Atlanta and Miami where there’s clear financial backing, good soccer markets and likely to have the stability of solid MLS teams backing them. I don’t have answers, but I really want to support the development in the women’s game in this country like I do the men’s; because I love this sport and I love what it does for communities, players, and fanbases. I’d like to see a women’s club come into the Philadelphia area and do it better. Not just be a Union “ladies” team. Play in the city, for example? Would be great. It’s a real puzzle that in a country where women have been the international standard bearers, we can’t do better for the sport on a pro level. When 5k women can’t show up on weekends to support a sport they claim to want more access, visibility and publicity of/to, why is it such a puzzle? Men support men’s sport. Where are the women? If there was enough money to be made, one of those four iterations of women’s teams would have made it. If women want women’s sports then they need to support it, pure and simple. 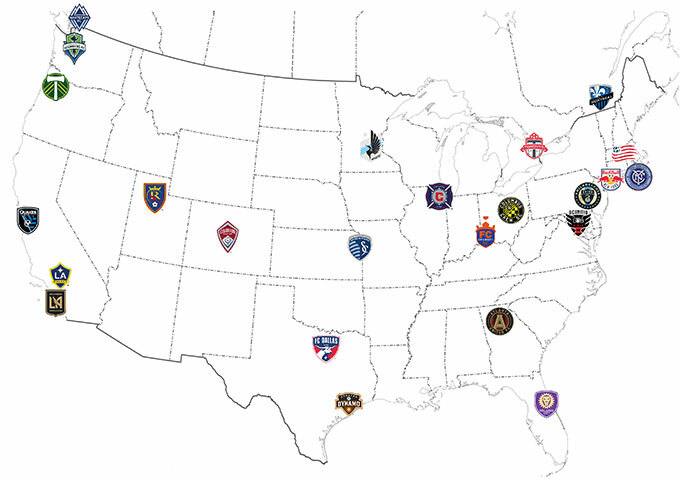 St. Louis, San Antonio, Sacramento, Las Vegas, Detroit, Raleigh, Tampa, Charlotte, Indianapolis: they seem to be unable to catch an MLS break, and many have soccer cultures to energize fan vases. Several would also help things fill out geographically. Austin: Somebody should convince Precourt that the home of SXSW would be better suited to NWSL than MLS and spare everyone the travesty of seeing another half-filled MLS stadium. Somebody buy or rent the Cosmos name and plunk a team in NY for league credibility and broadcastability. Hi everyone. This is Tim McDermott. I enjoyed reading the article (and enjoy reading PSP in general – I have it bookmarked!). I have been intrigued by this concept for a few years. In fact I reached out to NWSL officials a year or so ago and have spoken to some of my MLS colleagues with experience with women’s pro soccer. I have looked into how the prior franchises in Philly faired. I would think that playing in Talen might help change the overall draw although to what degree I am still unsure. It’s somethibg that I will continue to evaluate. I hope you don’t mind me commenting on this thread. Thanks again. Would be interesting if this was actually Tim McDermott. If so, would be interesting to see where the Union ownership was actually feeling in terms of actually fielding a legitimate NWSL team. If you are indeed Tim, I don’t think anyone minds your comment contributions (probably in fact welcomes it, with the grain of salt that you may not actually be “you”). I’m no events planner or prospective franchise owner, but I struggle to imagine the energy in the stands for the area’s pro women’s teams 2001-2012 following them to Talen a decade later. And that should make sense if only because of the differences in locations and infrastructures of those (suburban, university) venues compared with what Talen has to offer. But it also suggests to me that a successful re-re-boot of women’s pro soccer in the area may require fundamentally different marketing to a fundamentally different prospective fan base. Sara identified Portland as one of the MLS-owned NWSL franchises. The Thorns have attracted crowds larger than the Union have, and I know that some of that happens through the magic of the PNW. But I have little doubt Philly could conjure some of our own. Mrs. Buccistick likely feels different than I do, but this founding member STH to ALL of Philadelphia’s various pro soccer efforts has always assumed a women’s team would represent our city — in part by playing IN our city. And I’m not an SoB, but tapping into fan *passion* seems infinitely preferable to simply leveraging some existing infrastructure just because it’s there. In short, I think Talen “helping change the overall draw” only looks at the overall picture from a single, and very narow, perspective. A venue is necessary, but not sufficient. I trust that “Tim McDermott” knows as much from his outreach to NWSL officials and their MLS partners, as stated above. As a financially and emotionally invested fan, I for one would rather cheer a women’s pro team play *in a back yard* where everyone — players and fans and operators, alike — feels THIS MATTERS to all of us ON PURELY SPORTING GROUNDS than play in an 18,500-seater where only two rosters feel that way (at least, until they head back to their day jobs) while the operators and most fans spend the 90 minutes feeling comfortable for whatever reason (“We’re doing the right thing,” or “We can walk down past all the empty seats to get closer to the interns tossing t-shirts,” etc.). I don’t have a viable answer. But I sure as hell am looking forward to seeing the USWNT-Japan double-header at the end of this month — in our back yard. … and who turns out to see it. I agree, I think the SheBelieves Cup attendance, excitement, etc. could be a huge indicator of Philly’s readiness for the re-re-reboot of women’s professional soccer. Looking at the tournament schedule it goes Philly, Nashville and Tampa – all cities that don’t have a women’s club. Maybe it’s testing the market for the NWSL? Whether that’s true or not, I’m excited. Hey Tim, I’m glad that you respond to this post. Philadelphia has never had a women’s pro team since 2011 or 2012. It will be an honor to have a women’s team in partnership with the Union in about a year or two. Just to let you know that the USWNT and other countries will play in the SheBelieves Cup starting in two weeks right here at Talen. This could be a chance what so ever to see how fans will enjoy the moment! Once again, thank you so much for responding and I hope soon that you (and the Union) will have a women’s team. For Tim McDermott, thank you for posting on here and on twitter your hopes for another Philly Women’s pro soccer team. My family looks forward to that, too. Two options exist for immediate future to tap into excitement of this year’s world cup and test the market for a women’s team at Talen. 1. Sky Blue’s struggles are well known. Maybe step up and set up a few games on their schedule at Talen. Carli Lloyd is still a draw to Philly/South Jersey fans given a real venue. It makes Union look good, will attain much needed positive publicity as all their news has been bad. Their going under hurts NWSL so in their best interest to accept. 2. If that is not viable, then arrange local women’s college teams (several colleges in our area) a “world cup warmup” or post-cup tour with USWNT at Talen. Personally my family is looking forward to the February 27th matches and went that last time USWNT played at Talen. We enjoy watching them play as well as the Union. Thank you for responding on here, Tim, and for considering this.